Our company presents a new line of Super Doublet Apochromatic Refractors. We are currently producing 130 mm and 150 mm models for starters, and planning to go with bigger sizes in the future. We will be happy to discuss any questions or inquires you might have. Any idea when these will be ready to ship/purchase? Our pilot run is almost finished and ready to go at the end of January. All the orders placed before the January 31st will be with discount and bonus rings and plates. How about a "ball park figure" or "estimated cost" ? OK to say "subject to adjustment"
Introduce price for 130 mm will be approximately 5,400; for 150 mm - 8,600. Wow, Fluorite doublets! Interesting indeed. The history of this company will be interesting to read. I guess you know me very well. Agema Optics is my third company. The first one was Technical Optics in Ukraine, 1993-1998 - I produced optics for local customers and also for Jim Burr, Tom Dobbins and Yuri Petrunin. The second - TEC, 1998-2011 - I designed all models, set up optical production and produced optics for 13 years. The third - Agema Optics - I am planning to make more great telescopes. I have MD in optics and over 30 years experience in optical manufacturing. Optics is my life! Congrats!!! Looks good. Would be interesting to do a shootout with a Takahashi FS-152. Very nice to see another top notch US optical company! Eduard, I do have a few of your optics already: TEC 6 and TEC 8 MCs. Do you have any plans for making fast scopes (say faster than F5) for us imagers? I for one will be watching your company with great interest! I am very glad you like my optics! I have some ideas for fast ones: 130 mm F5 and 155 mm F6.3 with diffraction field about 60 mm diagonal and great color correction... but later. I sent a message through the website but it looks like this is a better way to ask questions. For visual observers, is there any way to to have a lighter tube option? The 130 OTA is 12 kg, and that is as much as a TEC 160. One of the advantages of the Takahashi FS 128 and FS 152 was their light weight design. I realize that some will be used for imaging, but making a visual version (perhaps with a 2.5” focuser and lighter tube) would be nice. The 180 especially will be a great visual scope, but if it is 20 kg it will be bulky. I think a doublet should be able to be made at 16-17 kg with a smaller focuser. I don't understand the website when it says "we use fluorite with unique dispersion properties in our design." I thought fluorite was fluorite, or is there something special with the kind you use? Edited by Derek Wong, 07 December 2016 - 08:30 PM. The weight includes a tube assembly, rings, plates and a handle. I will provide the OTA weight only. We are using a 3.5-inch focuser for both models to start, but we're planning on making smaller focuser for visual use. Also, we have an option to attach a FT focuser. The fluorite we use is just flourite. The values of its dispersion, especially in blue-violet region, allowed us to find a better matching glass - so the doublet has better correction for this region. The same dispersion for ED glass gives a slightly worse match, so we opted for the fluorite. Edited by Edward Try, 08 December 2016 - 04:27 PM. Still enjoying the 8" f15.5 you and Yuri made for me. Any plans for longer fl apo,s? The weight is at the heavy side for a doublet nonetheless. I think it should be able to reduce a bit, the current weight will discourage a lot of potential customers. Hi Richard! I am glad you still have it. I remember you and the "special" label for your MAK. Why do you need the longer APO? For better correction? The designs look fabulous on paper. If you can execute them to a high level, they could be some of the greatest scopes ever. Edited by Derek Wong, 08 December 2016 - 05:31 AM. You came out with a 130mm which is more or less what everybody noted as lacking for visual in doublet fluorite scopes as there were a couple of threads discussing the Takahashi FC series and how a 120mm fluorite doublet would we awesome (hey, don't mind the extra 10mm aperture), but I must be brutally honest - the weight is a lot. I will echo Derek's feedback - a smaller diameter FTF, a thinner aluminum OTA, lighter rings and dovetail could shave a LOT of weight from this scope, reduce the cost and make it more appealing to visual only people. This is by no means a criticism of the product which looks awesome! It's just something for you to consider so that it appeals to visual only amateurs. I also note that the price is a bit on the high side, but it depends on extras e.t.c. I suppose, as the preliminary price you quote for the 130mm is near TEC 140mm territory - a scope you are intimately familiar with in terms of color correction, weight of telescope and reputation in the market. I appreciated your comments and suggestions! Thank you! Actually, I was surprised myself with the weight but was honest with you and posted actual readings. Today I checked it again and got different readings, so the scale went to trash… The updated OTA weight (no rings, plates and handle): 130mm – 9.5 kg, 150mm – 12.8 kg. Let’s go into some nuances about the weight: the objective required very tight tolerances to achieve this outstanding level of correction. This is why we use complex lens cell that added some weight - a price to make this correction possible. I agreed about the focuser - we planned to make a smaller one for 130mm in the future. Currently only 3.5-inch focuser is available that gives better balance to the tube and is universal for both visual and digital. If I use 2.5-inch focuser for 130 mm model - you will not be able use it with FF for digital. Also, the focuser handles the movement without any radial deviation (good advantage) and required solid parts for that. This feature added some weight too – another sacrifice to have a better performance. Price: Raw optical material dictates the cost for fluorite telescopes. Remember how much was TEC110FL? My price is in the same range but with extra 20mm of the aperture. Fluorite cost is about three times more that ED glass. This is why compare TEC140 cost is not “apple to apple”. Please compare my cost with fluorite telescopes and you will see that I am very competitive. Takahashi had this price level many years ago. Thank you again for good wishes and I will be happy to have you as my customer! 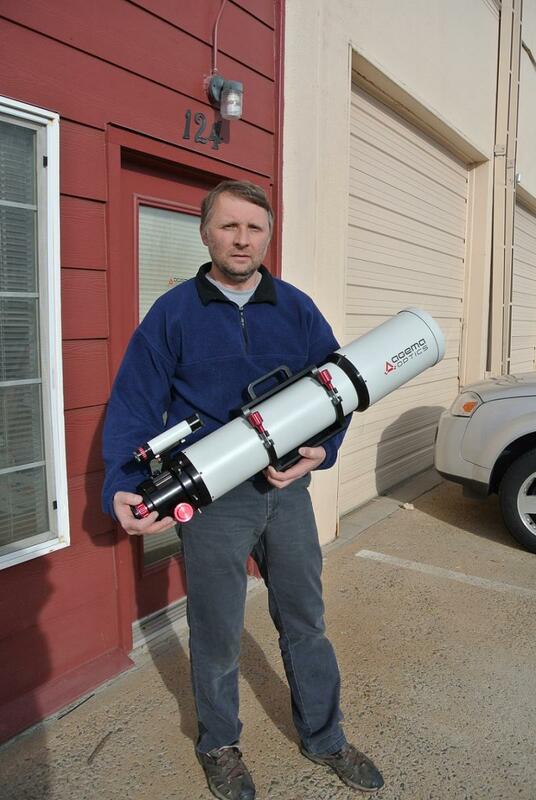 I am excited about this line of telescope as I think others will be. Particularly the 180 f/9 fluorite doublet. I have a minor concern about the name: there is already a popular vendor called Agena Astro http://agenaastro.com/. It's possible to be confused. The was an Owl Optics and Owl Astronomy at one time. But that's for another thread. It would be interesting to offer unconventional telescopes from time to time in addition to the main product line.